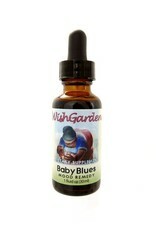 WishGarden Herbs' Baby Blues Mood Support is for when new moms experience the blues post-partum. This powerful but gentle combination of herbs provides nourishing nervines, liver tonics, and herbal balancers to support healthy hormone levels. With 30+ years' experience making herbal formulations for pregnancy and child bearing, WishGarden is the trusted name in all-natural pregnancy support for moms-to-be, new mothers, doulas, and midwives.